" Dark or black spots on skin are usually harmless and merely a sign of excessive exposure to the sun or increased pigmentation. Black skin spots or dots can also be caused by moles. However, less common skin conditions that may manifest as dark or black skin spots include melanoma, a type of skin cancer. Except for the latter, these harmless skin discolorations often do not pose any danger to one’s health but may need treatment in order to improve one’s appearance. If you see any changes in the spot, mole bump or general skin appearance, be sure to see a dermatologist. This guide will help you learn about the different causes and treatment options to get rid of the spots. " Causes of Black Spots on Skin Include Moles (top), Seborrhoic Keratosis (bottom left, due to aging), and Nummular Eczema (bottom right, unknown cause). Changes in mole size or additional growth in and around the mole. Constant itching in spot or mole area. Tender skin where spot is located. General changes in mole appearance. 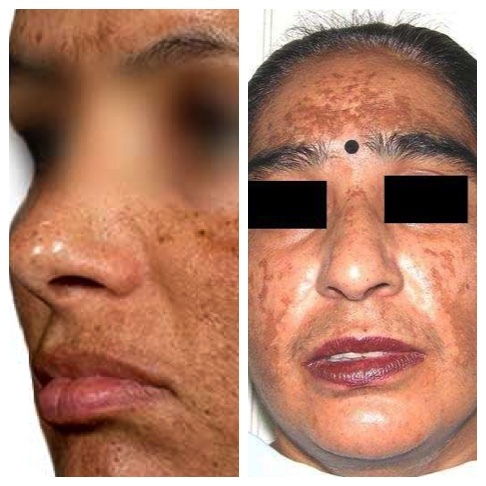 Dark brown to brown-black spots are commonly associated with aging and excessive exposure to the ultraviolet rays of the sun. These are common in people over the age of 40 and may occur in all races, although they are more pronounced among fair-skinned people. Hyper pigmentation or overproduction of dark skin pigments called melanin can cause black spots to appear. This may occur after some inflammation such as acne heals, or after improper shaving. 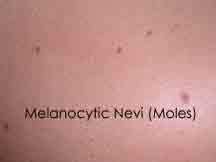 Nevi or moles at times may also appear black and may be either flat or raised. 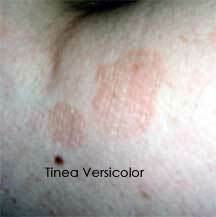 TineaVersacolor (also called sun spots) is the result of a skin yeast infection. The color is caused by a chemical reaction in the fungus that blocks natural skin pigment. The problem is harmless if your immune system is functioning normally. It is not cancerous. Treatment involves curing the infection with a product such as Naturasil TineaVersicolor. The condition is not contagious and may require multiple treatments. Antibiotics and other drugs like tetracycline, sulfonamides, amiodarone, phenothiazine, and phenytoin commonly cause such spots on the skin. Every adult has moles. They are either congenital (present at birth) or acquired, which means that they appeared after a person is born or If an individual has more than 50 moles they are considered to be at higher risk for a skin melanoma (skin cancer). A mole can be black, red, tan, pink or without color. They are round and slightly raised or flat. An important cause of black spot on the skin is melanoma, the most dangerous type of skin cancer.It is caused by abnormal changes in the melanocytes, or cells which produce the skin pigment called melanin. If you see any skin condition such as a mole changing in shape, color (or has multiple colors in one mole), size, and has an irregular border, or is bleeding, be sure to bring it to the attention of a Doctor. Common practice is for the Dermatologist to remove the mole so that it can be sent to a lab for testing. If a melanoma, and if caught early, an Oncologist will remove the skin area surrounding the mole until they are sure that the cancer has been completely removed. More advanced cases will require additional treatment. 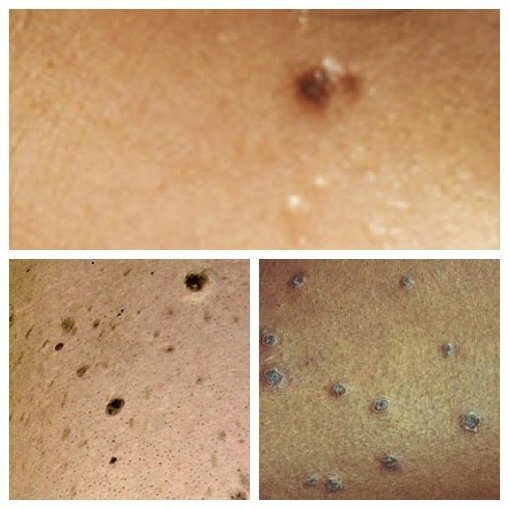 Pictures of Black Skin Spots that are a Melanoma. Have any mole that changes in appearance or size or that look different than other skin spots or bumps checked by a Dermatologist. Moles are not treated unless they pose a medical risk, if they rub against clothing or for cosmetic reasons. If you have 100 or more moles be extra careful and consult a dermatologist, particularly if you have a family history of familial atypical multiple-mole melanoma (FAMMM) syndrome. If you see a black spot on mole it may or may not be a problem. Moles are very difficult to diagnose. A skilled dermatologist can both track four factors listed above that indicate that a biopsy is needed. If a dermatologist sees no change along with no other signs, then it may be prudent to keep an eye on the mole. On the other hand, a mole with a black spot that shows other colors, and that is changing would warrant a biopsy. 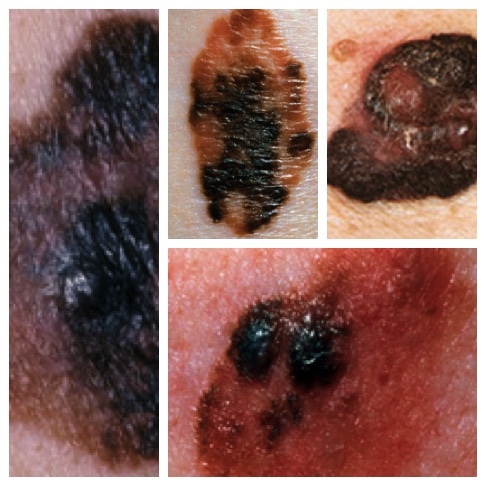 All of the examples below of a black spot on mole shown below are malignant and require removal by a dermatologist. To learn if black spots on a mole are cancerous and if you need to treat them, they should be reviewed as part of an annual mole check with a dermatologist. Liver spots (also called solar lentigines, seborrheic keratosis, freckles, sun damage spots or age spots) look like small spots, lesions or areas on the skin. They are caused by skin areas prone to excessive sun exposure such as the arms, shoulders, hands and face. Liver spots are seen in people of all ages but are more common in people who have a fair skin complexion and when age 50 or older. These spots are sometimes confused with melanoma spots, but if not malignant they do not require treatment. Liver spots have sharp borders and should be all one color. Like other forms of dark skin pigmentation, they can be lightened for cosmetic reasons with skin-bleaching remedies that contain the ingredient hydroquinone such as the brand Porcelana or Esoterica. Also consider products with alpha-hydroxy acids and vitamin A acid derivatives. Individuals can also have them removed for purposes of improving skin appearance. In a dermatologist office treatments can include liguid nitrogen spray (cryo-surgery) or Intense Pulse Light IPL) or lasers. Individuals with darker skin complexion may have moles scraped off (called curettage or dessication). See a Doctor to differentiate between the brown or black spots associated with liver spots to those that are melanomas which tend to have shades of blue, white and red. 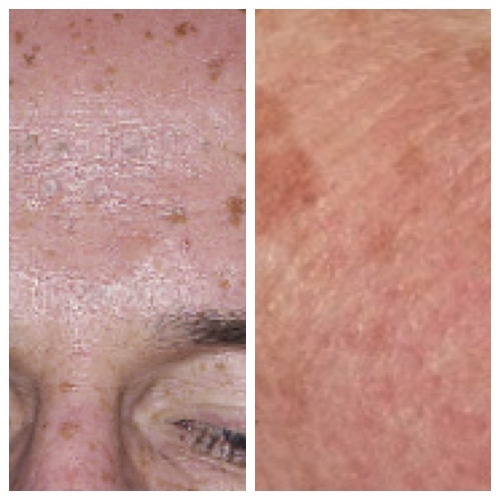 Melasma results in brown to gray skin spots. Most people see the spots on sun exposed areas such as the face, followed by the upper lip, chin, forehead, cheeks and upper portion of the nose. The condition is more common in women. In some people hormones trigger the condition. If you are prone to Melasma the best approach is to avoid the sun or wear sun screen and protective clothing. In individuals prone to Melasma, using only sunscreen may not provide all of the protection needed. The dark skin spots caused by Melasma can fade on their own as underlying triggers such as hormones decline. Spots can be treated with creams that contain Hydroquinone such as Porcelana, medications that contain corticosterioid, tretinoin, kojic acid or azelaic acid. Black spots on skin that are caused by sun exposure and related to aging can easily be identified even without laboratory tests. Other types of non-cancerous dark discolorations in the skin may also be identified by their history and physical features. To rule out any disease that may be related to skin changes, blood tests may be done. To diagnose skin cancer, a skin biopsy needs to be done for confirmation. Other features like a history of abnormal changes in size, color, and texture of the lesion, bleeding, or a sore that does not heal give clue to the diagnosis. Dark brown, black spots on skin or tiny dots usually do not have accompanying symptoms if they are related to changes in aging. Hyperpigmentation due to inflammation, drug intake, or hormonal changes may be accompanied by symptoms related to the cause. If black spots appear asymmetrical and rapidly change in size, shape, and color, they may be symptomatic of melanoma. These spots may bleed, and the borders may become irregular. To reduce the appearance of dark or black spots on skin, dermatologists recommend using sunscreen. Black spots may be lightened by using over-the-counter bleaching creams and lotions such as elure. Lightening cosmetics may also be used to cover black spots such as Clinque Dark Sport Corrector or Pro-X from Oil of Olay. One is further advised to use more protective coverings like hats, long sleeves, or umbrellas to avoid not only sunburn or skin aging, but skin cancer as well. For abnormal skin changes that are suspicious, one should seek immediate diagnosis and medical treatment. Skin cancer involves surgical treatment to remove the tumor, and depending on the stage of the disease, may also include radiation therapy, chemotherapy, and immunotherapy. Dermatologists may also prescribe creams that contain hydroquinone which are used to bleach darkened skin. Severe cases may also be treated with tretinoin and cortisone cream. These treatments may need a few months to show improvements. Other options include chemical peels, microdermabrasion, laser treatment, or other cosmetic procedures.